Promotion Design & Advertising Since the early 1990s, the American artist Frank Stella's formal concerns have evolved from the minimalist angularity of his early paintings, to wall reliefs, and on to fluid freestanding sculpture that extends into architecture. 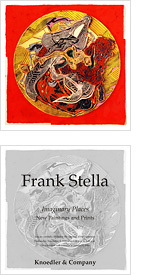 For a series of exhibitions over time of Stella's large-scale New Work and Imaginary Places at Knoedler & Company, we created commanding advertising campaigns in Art Forum, Art in America, and ARTNews that featured the tangled, layered, and looping shapes of his dense abstract sculptures composed of found and cast elements in brightly painted stainless steel and bronze. We were then commissioned by Frank Stella directly to design and produce a printed portfolio of his various site-specific architectural constructs and structures, with works ranging from small models to portions of buildings at full scale. This compendium of his architectonic concepts highlighting his profusion of graphic signs, twisted grids, garish color, and graffiti-like marks was targeted towards potential commissions for free-standing sculpture for public spaces and developing architectural projects. The Art in America critic, Robert G. Edelman, commented at the time "Stella's effusive murals look like a computer design program run amok."